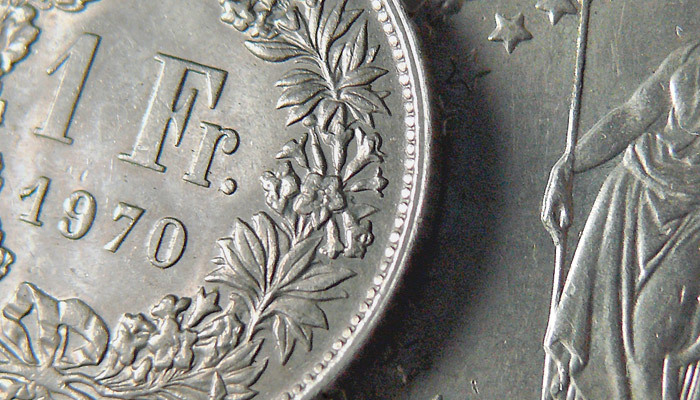 Why did the BoJ do all this monetary easing and talking down the yen? 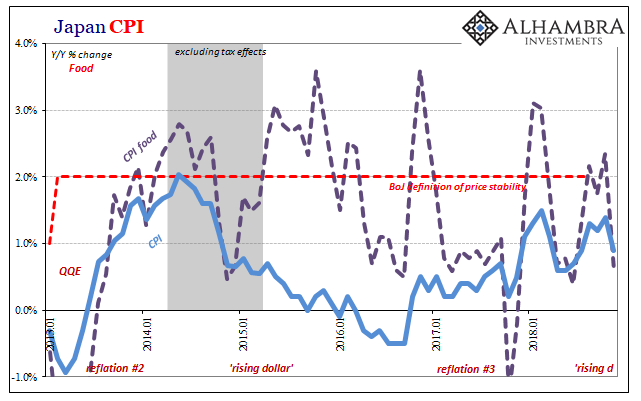 Because without it, there would have been deflation of 2%, and this would imply, according to Keynesians, not only a liquidity trap (banks do not want to lend, firms cannot invest) but potentially a deflationary spiral (deflation causes wages to fall, wages fall and more deflation emerges). 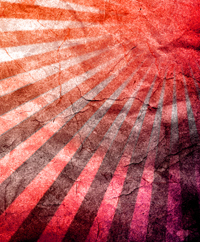 Japanese exporters are in strong price competition with China and South Korea. 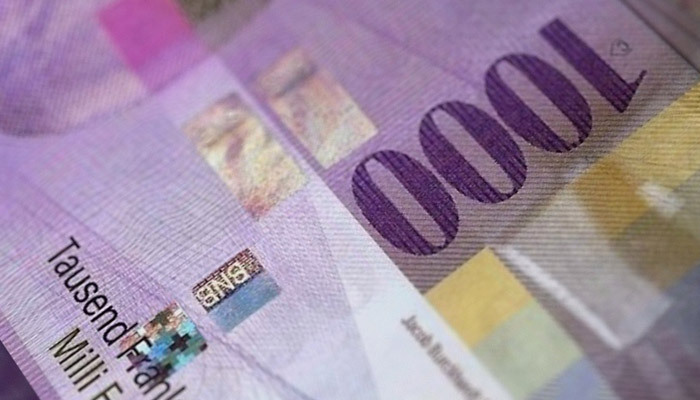 An exchange rate of 100 to the dollar is already above the level of 90 that Japanese exporters wanted in 2010/2011, but the Japanese profit from low wage increases and higher technological standards compared to their counterparts from China and Korea. We computed a fair USD/JPY value of 95. 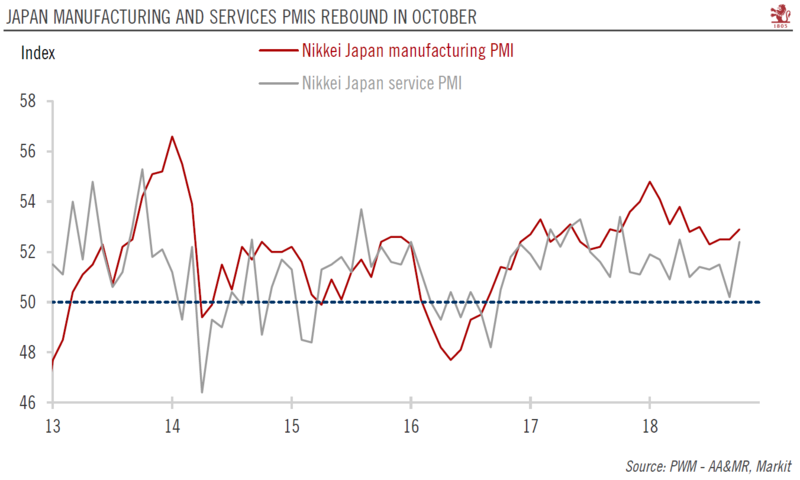 If the weak yen persists, the supply chain of Japanese multi-nationals will be more and more insourced, back from China and other (formerly) cheap countries that have for years experienced high wage increases. 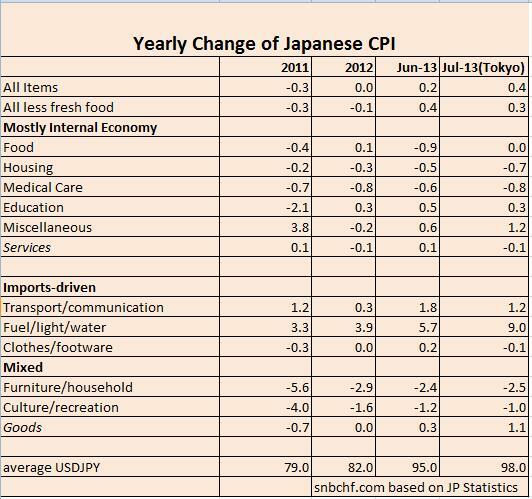 This creates jobs and, helped by some higher inflation caused by the weaker yen, higher wages. 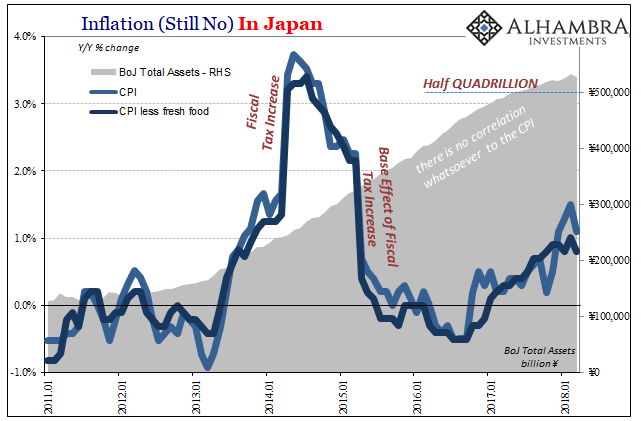 While the euro and the US crises are far from over, the Japanese balance sheet recession (i.e. 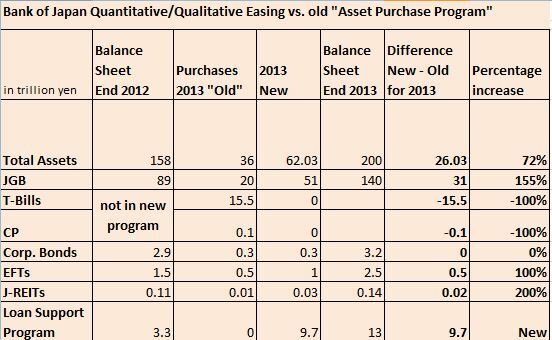 people want to minimize debt, they do not want to spend, firms do not want to borrow) had already finished in 2010. 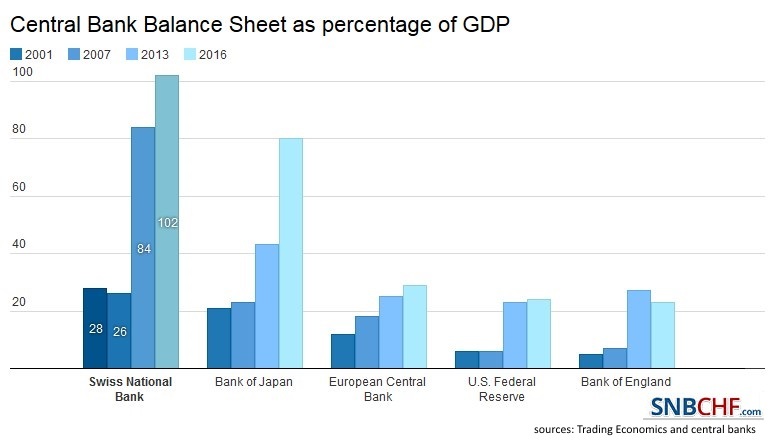 The Japanese have high savings, as opposed to many ordinary Americans, they are able to spend with their own money, they do not need deficit spending incited by the Fed. 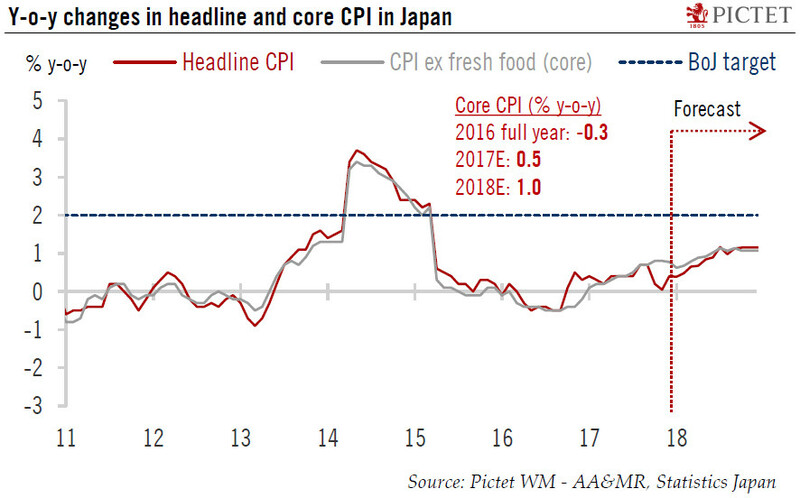 The quadruple effect of higher spending, higher exports, more jobs and fiscal spending will move Japan into inflation, no doubt. This is reflected in the famous 80-120-100 trade for USD/JPY that many hedge funds play: the US recovery and overshooting will move USD/JPY to 120. Some like KPF’s Tao Long think that with the exit from Abenomics the yen should come back to 100. Robert Savage of FX Concepts (see his 120 suggestion on Bloomberg) or Alan Ruskin of Deutsche Bank are opinion leaders in the current short yen trade. 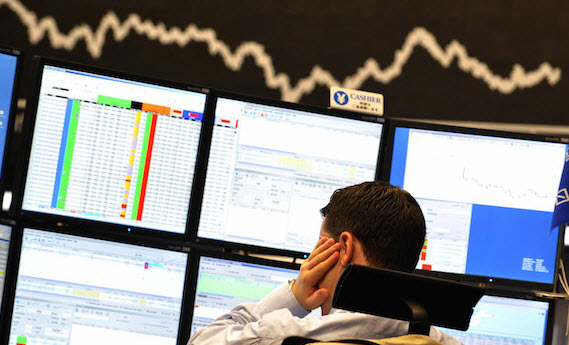 They are able to manipulate a lot of trading (quant) algorithms and FX traders. 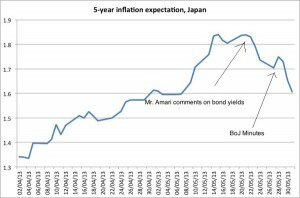 Some hedge fund managers like Kyle Bass of Hayman Capital or Axel Merk of Merk Investments even see JGB yields explode and a continuing weakening of the yen to 150 and more. 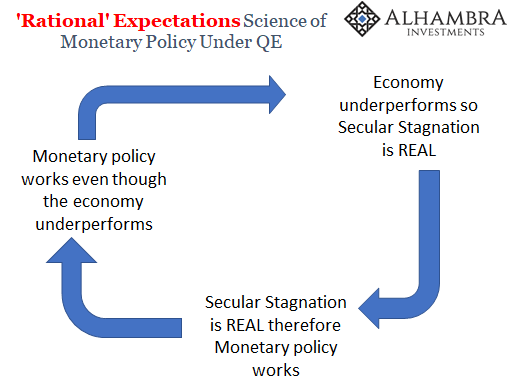 What many do not grasp is that the deflationary “tradition” and the Japanese-style technology (via hedonic adjustments) will be able to counter imported inflationary effects. 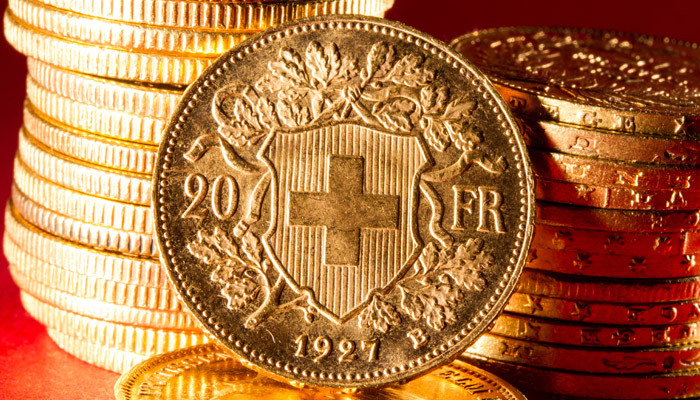 Despite an exchange rate of 100 or more, a loss of 35% against dollar and euro, inflation is still far. 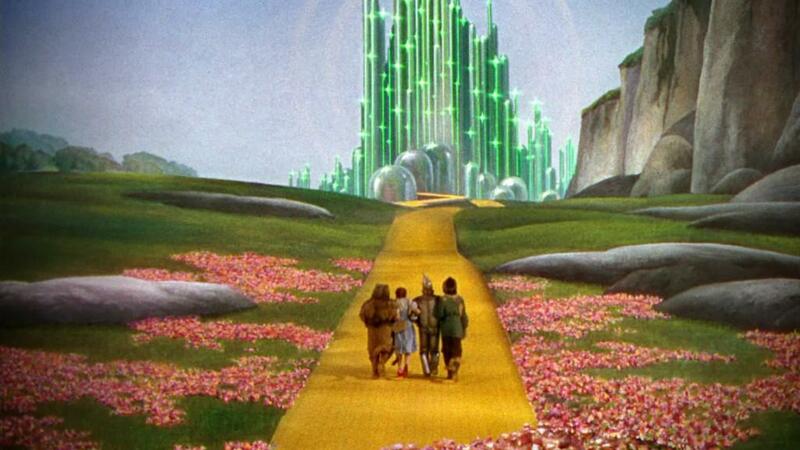 But the minus 2% deflation scenario has been avoided. 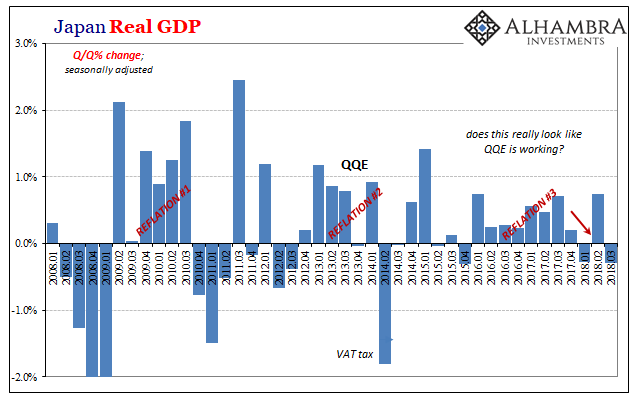 Thanks to higher competitiveness and still low inflation, Japan should see the strongest real GDP growth of the G7 nations for Q2 and Q3/2013. 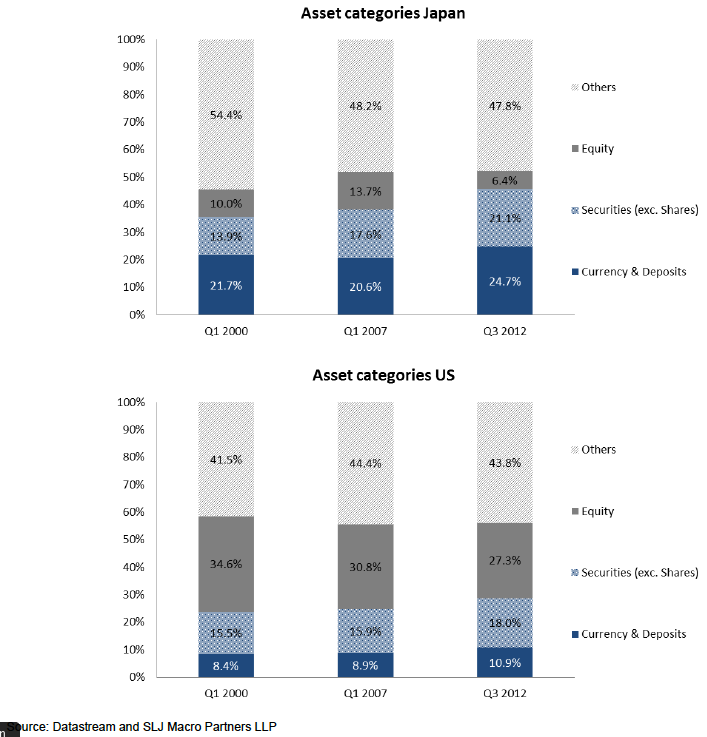 Japan grew by 0.9% QoQ and the US only by 0.6% (annualized 2.4%) in Q1/2013. 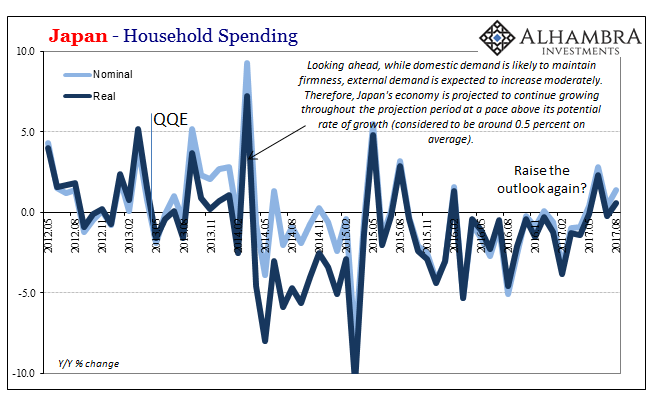 Each year in May the US economy softens a bit but Japan becomes stronger (“Sell in May effect”) and these seasonal effects help to move the Japanese current account into surplus. 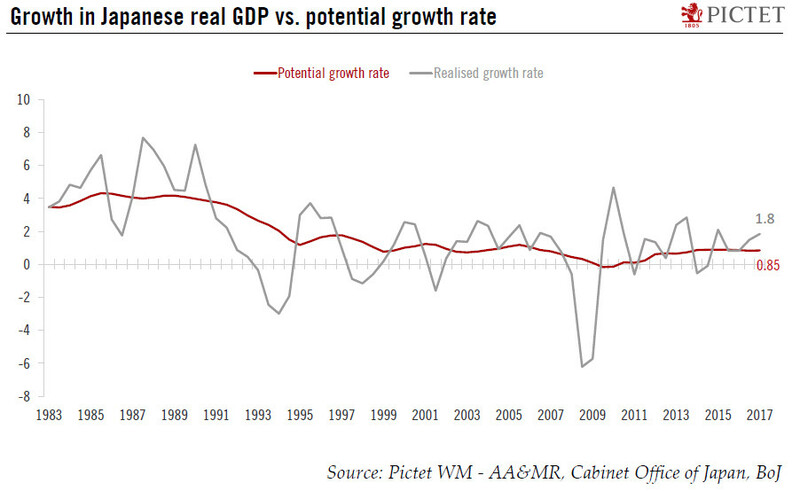 The growth gap between Japan and the US will be bigger: we expect that Japan expands by 0.5% more than the US in Q2. 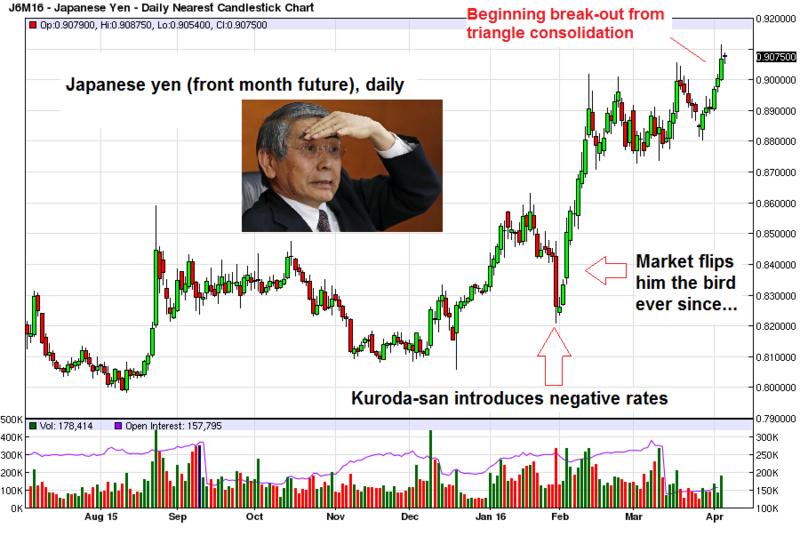 A small difference in favor of Japan combined with a current account deficit would further weaken the yen. 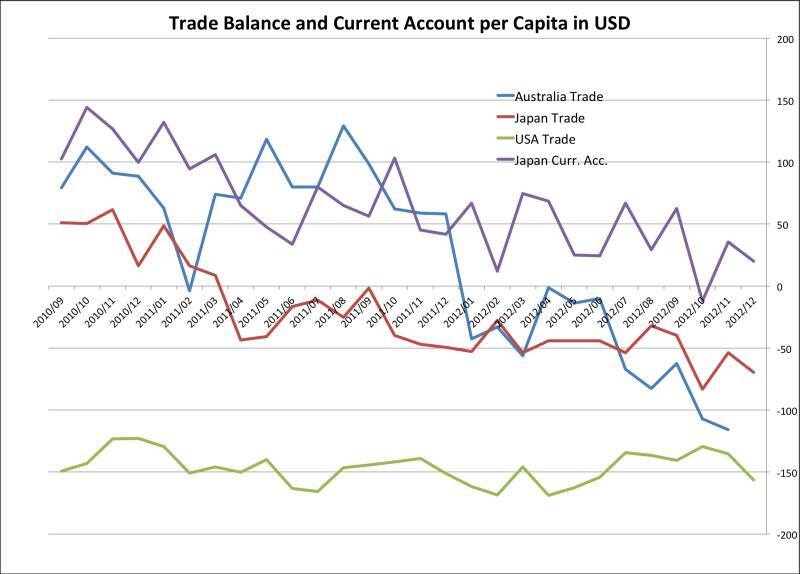 A big GDP gap combined with an improving Japanese current account, however, shows that even the 80-120-100 trade might not be sustainable, this summer the 120 should get out of reach and the yen could improve to 90 or 95 again. 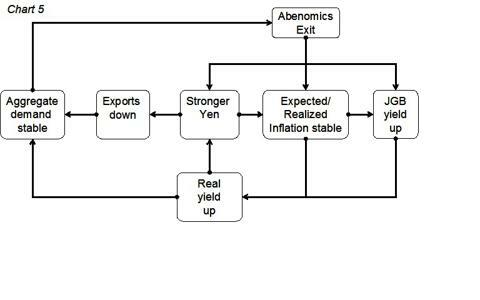 A stronger yen will mean that inflation will be limited and JGB yields will fall again: a Kyle Bass scenario, a Japanese default, might be exaggerated. 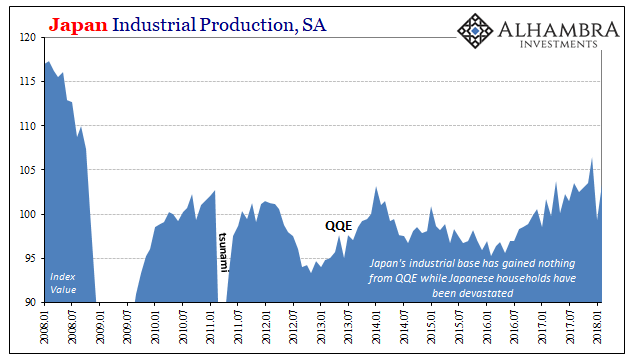 If, however, the US recovers, improves its competitiveness issues, reduces unemployment substantially (what we doubt) and US inflation rises, then Japan could really go bust, because Japan will need foreign investors to finance the debt that demand far higher yields. Due to the relatively strong dollar and, as we have seen in the Manufacturing ISM, the US not being able to create many jobs in manufacturing, maybe some in services. Effectively US manufacturing is weaker than ever in the last 3 years. In the end, most of what Americans spend will be beneficiary for countries with strong trade surpluses like China, Germany and Switzerland. Japan is also increasing its trade surplus with the US, but is currently losing against China, Germany and austerity-ridden Europeans. 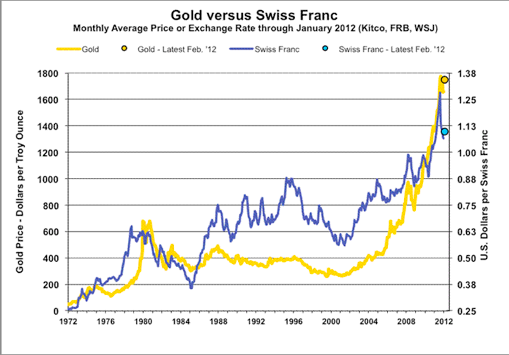 In summary: The famous 80-120-100 trade might be rather a 80-104-90 trade. 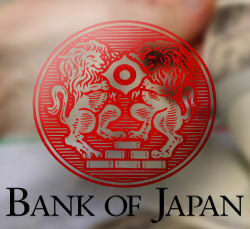 I personally recommend to buy Japanese stocks but denominated in yen. Be sure that you buy on dips. 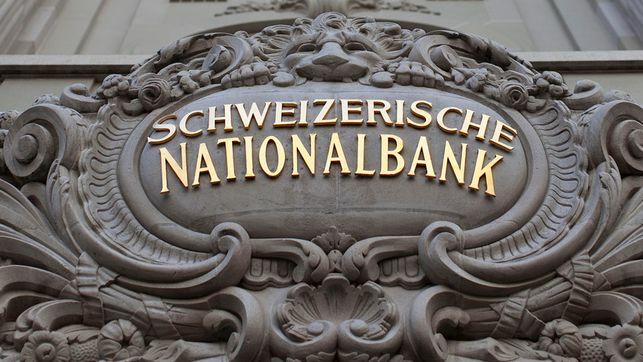 The SNB followed this strategy in Q1, visible in an increased yen and equities share and high profits.